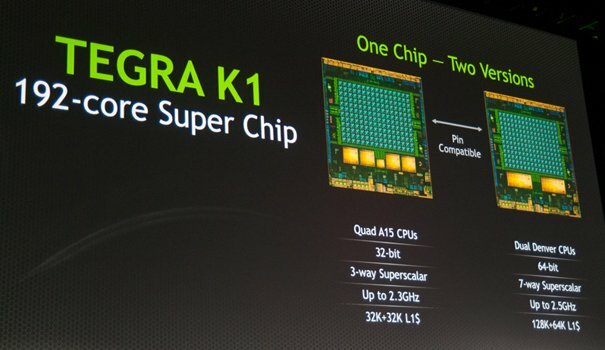 Nvidia announced its upcoming Tegra 192 core super chip at CES 2014. The new chip is based on Kepler architecture and will be released in two different versions: a 32-bit option with a 2.3GHz “4-plus-1” A15 CPU and a 64-bit unit with a 2.5GHz dual-core Denver CPU. The Keplar architecture used to build the Tegra K1 is the same was used to build the GeForce GTX 780 Ti graphics card. Nvidia claims that the Tegra K1 has more power than the Microsoft Xbox 360 and Sony’s PlayStation 3 consoles. The Kepler was originally designed for desktops and notebooks and later added to supercomputers.Nvidia is bringing its graphics to the new DirectX 11-powered GPU, in fact, that it will come with support for Unreal Engine 4 and OpenGL 4.4. The 32-bit Tegra K1 will be available in the first half of this year, followed by the 64-bit processor in the second half of the year.